According to the U.S. Department of Health and Human Services, a healthy diet should consist of fruits, vegetables, whole grains, low-fat dairy products and lean meats. On top of eating well, you must also minimize your consumption of cholesterol, sodium, sugar and saturated fat. 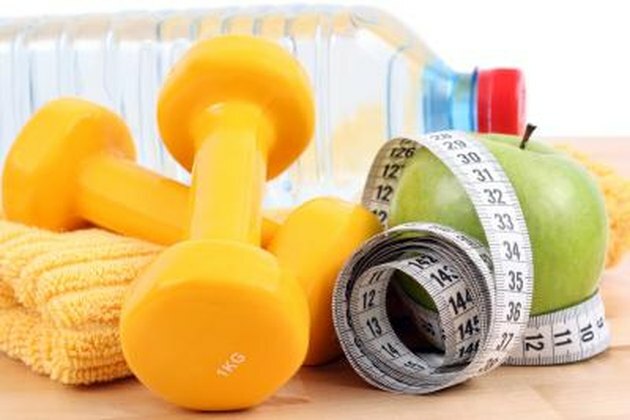 In conjunction with regular exercise, a healthy diet can reduce your risk of heart disease, osteoporosis, type-2 diabetes, high blood pressure and some cancers. If you’re overweight, eating healthfully and exercising regularly can help you lose weight safely and keep it off. If you don’t have a weight problem, physical activity and a healthy diet can help you maintain your current weight and reduce your risk of gaining weight as you age. Healthy foods are generally lower in calories and higher in nutrients than other foods, and regular physical activity burns off extra calories to keep a healthy physique. According to the National Institute of Diabetes and Digestive and Kidney Diseases, a combination of working out and eating healthy foods can boost your energy level and help you feel more alert and aware, both mentally and physically. Healthy foods give your body the nutrients and vitamins it needs to function at its best. Exercise stimulates brain chemicals that help produce feelings of happiness, contentment and relaxation, so you’ll feel better if you workout on a regular basis. Physical activity can also boost your physical appearance as you burn fat and build muscle, which is a significant factor in boosting self-confidence and inspiring a satisfied life. Exercise and healthy eating can help make your life more diverse and interesting. Seek creative ways to be physically active in your daily life and don’t to stick with the same exercise routine all the time. Exercise with co-workers, go dancing with friends, play on a sports team and spend active time with your kids and family members. Following a healthy diet can also bring up opportunities for home cooking, culinary classes, farmers’ market visits and more fun activities.